The Chords, a South East London group, formed in 1978 when singer/guitarist Billy Hassett and his bassist cousin, Martin Mason, advertised for musicians in the NME and found guitarist and songwriter, Chris Pope. Original drummer Paul Halpin did not stay long, at least behind his drum kit, and eventually became the group's tour manager. In his place came Brett "Buddy" Ascott, and by March 1979 The Chords were taking the stage. They gigged continuously over the spring and summer, headlining two mod festivals at London's Marquee Club and recording their first BBC Radio 1 session for DJ John Peel in early July. Amongst their early supporters were Paul Weller, who caught one of their first shows, and Sham 69's Jimmy Pursey, who signed the group to his JP Productions company. 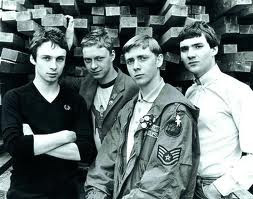 The quartet recorded a handful of demos for Pursey, before the relationship soured after he heckled The Undertones at a concert which the Chords had opened. Polydor then signed the band to a recording contract. For their debut single, the Chords chose one of the songs recorded for Pursey, "Now It's Gone", re-recorded it and had it released in September 1979. It rose to Number 63 in the UK Singles Chart. They followed it up in January 1980 with "Maybe Tomorrow", which, bolstered by rave reviews in the press, shot in to the UK Top 40. A second Peel session was recorded in March, and the next month their third single, "Something's Missing", arrived. This taster for their debut album, So Far Away, reached number 55. The album made number 30 in the UK Albums Chart in May, bolstered by a UK tour. The album included two cover versions; Sam & Dave's "Hold On, I'm Comin'" and The Beatles' "She Said She Said". Allmusic gave So Far Away 4.5 stars, the second highest rating possible. "The British Way of Life" single arrived in July and reached number 55, and "In My Street", released in October, topped out at number 50. The group continued touring, until a show at London's Music Machine in November 1980. Hassett was relieved of his duties and the former Vibrators' singer Kip Herring stepped in. The old line-up was featured on the cover of their next single, "One More Minute", which arrived in May 1981. It was a flop, as was August's "Turn Away Again", and the Chords called it a day the following month. In 1986 a live album entitled No One's Listening Anymore was issued, which was recorded back in 1980. A decade later, the double album compilation CD, This Is What They Want was released. This is what they Want! 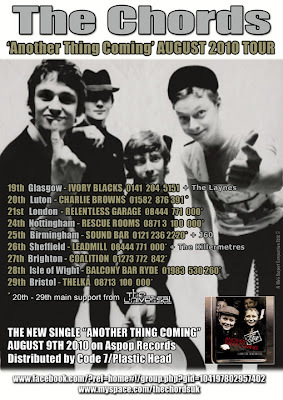 In August 2010 The Chords are back out on the road promoting a new single 'Another Thing Coming' seeing them take in gigs at Glasgow,Luton, London, Nottingham, Wolverhampton, Sheffield, Brighton,Isle of Wight and Bristol.